The Extang Express Toolbox tonneau cover is made to open and close easily with fingertip release by just one person. When you roll the tonneau up, it will secure right behind your toolbox with heavy duty luggage style clasps. Features a heavy-duty locking rear tail rail. Fits with Existing Toolbox Fits most standard 18-20" size toolboxes. L-Channel: Perfect Fit Patented L-Channel design and sealing system bridge the toolbox-to-tonneau gap. All Climate Automatic self-adjusting tension system keeps tarp taught in all conditions. Quick Release One finger release levers at the cab and tail provide easy removal for full bed usage. Bows Roll Up with Tarp Heavy-duty bows are pre-positioned and conveniently roll up within the tarp for quick easy storage. *Toolbox not included. The Extang Express Toolbox Tonno is made to fit most standard 20" tool boxes. It is engineered with exclusive features that provide instant truck bed protection with top-notch looks and superior performance. 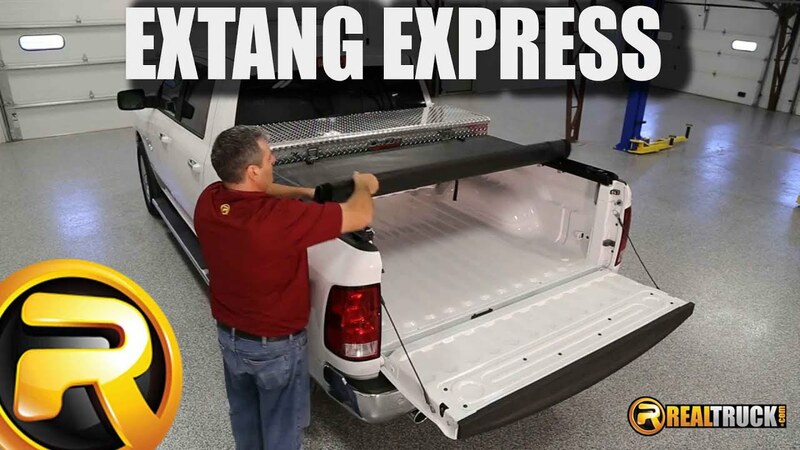 The Extang Express Toolbox tonneau cover comes completely assembled and can be quickly installed on your pickup. It can be easily installed with the built in clamps. Each product comes with easy to understand vehicle specific installation instructions. The Extang Express Tonno Toolbox Tonneau carries a lifetime warranty against defective materials or workmanship on all truck bed cover rails, aluminum components, clamps, bows, hardware and vinyl covering.